Whether he's quoting Wordsworth or having words with a particularly obtuse judge, Horace Rumpole always knows what he's doing--even if no one else does. 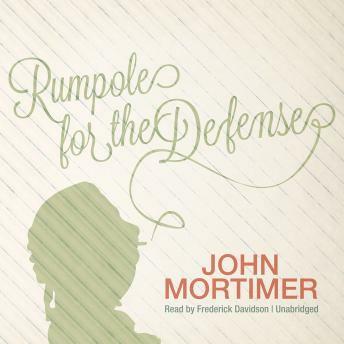 In this delightful collection of stories, Rumpole straightens everyone out in the shocking case of a "bent copper," gallantly teaches a professor of moral philosophy about blackmail, consults with the dear departed when a will is contested, traces the path of true love when a doctor is accused of murder, and (in the name of duty, of course) drinks to excess with a teetotaling member of the prosecution. There is even a rare moment or two when Rumpole finds himself appreciative of "She Who Must Be Obeyed" (Mrs. Rumpole), when she inadvertently provides some essential clues that clinch his cases. Stories in this collection include "Rumpole for the Defense," "Rumpole and the Gentle Art of Blackmail," "Rumpole and the Dear Departed," "Rumpole and the Rotten Apple," "Rumpole and the Expert Witness," "Rumpole and the Spirit of Christmas," and "Rumpole and the Boat People."